See Coral and Family on Travel Channel "Lifes A Beach"
Film "Exuma" by Colin Ruggiero...click and be amazed! If the Exumas are a necklace of sparkling jewels, then Staniel Cay is the diamond pendant. The many islands, forming a chain stretching 100 miles southeast of Nassau, are flanked by Exuma Sound to the east providing deep water reefs and offshore fishing. The shallow banks to the west provide sea gardens, anchorages, shallow reefs and passages between the islands. There are beaches everywhere...if you find someone enjoying their privacy, go to the next one! The ocean beach at Staniel Cay stretches almost the entire length of the island, with reefs just offshore for great snorkeling. 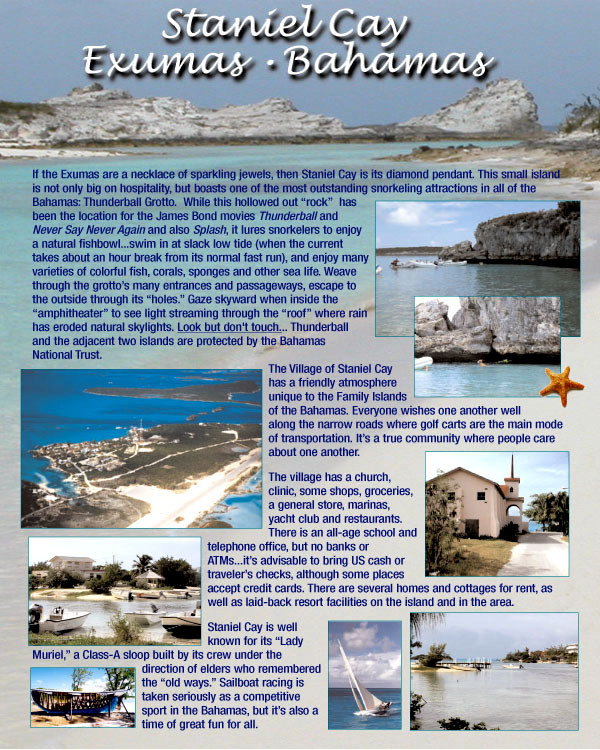 There are 365 islands in the Exuma chain (one for each day of the year), with Staniel Cay in the center.